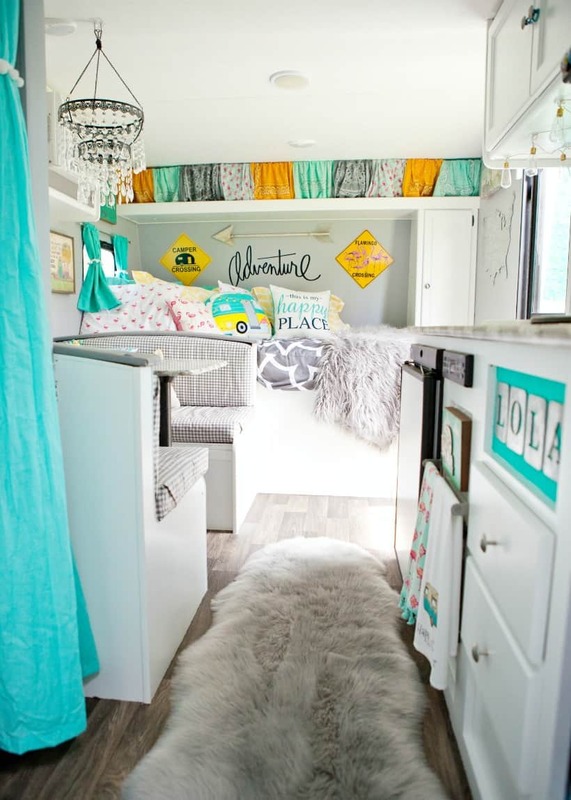 This colorful boho chic camper makeover is absolutely gorgeous! 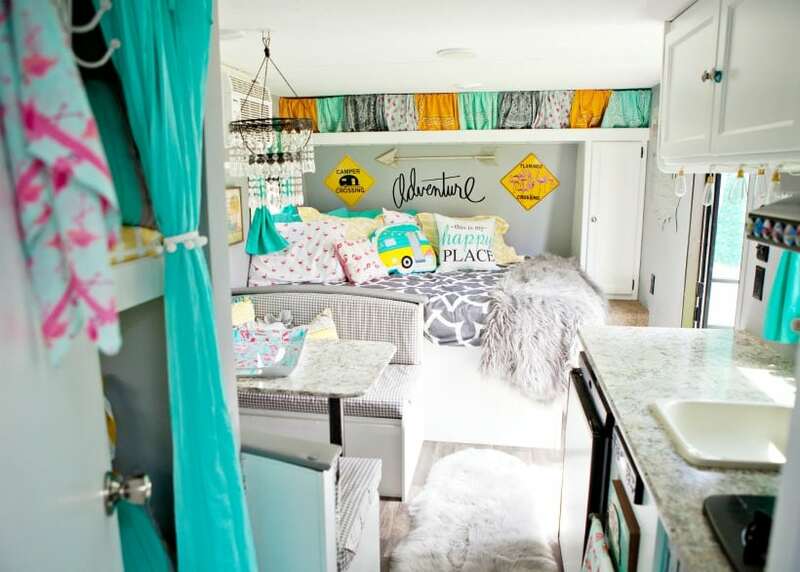 It’s fun and playful and makes the whole camper feel bright and cheery. Want to do this to your camper? I’ll show you how! 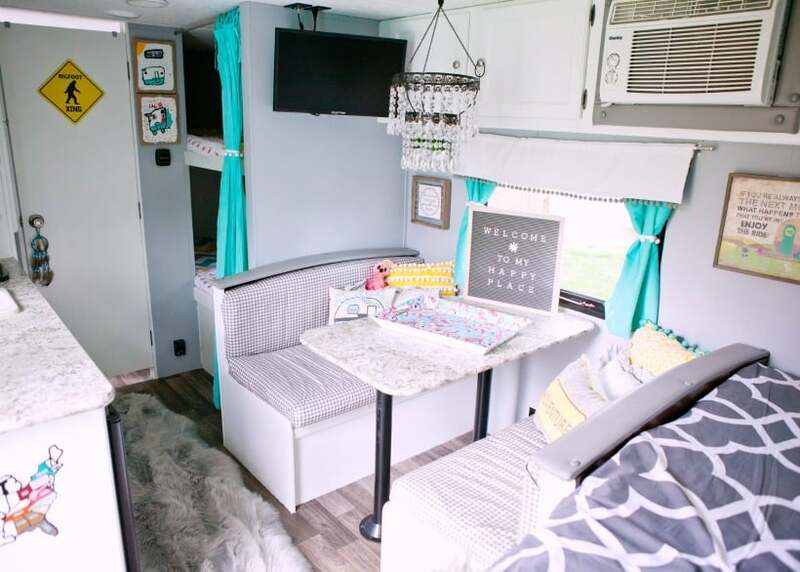 I came across this stunning camper makeover that was done by Brooke Daniels. She was gracious enough to allow me to share it with you. I knew you would love it just as much as I do! 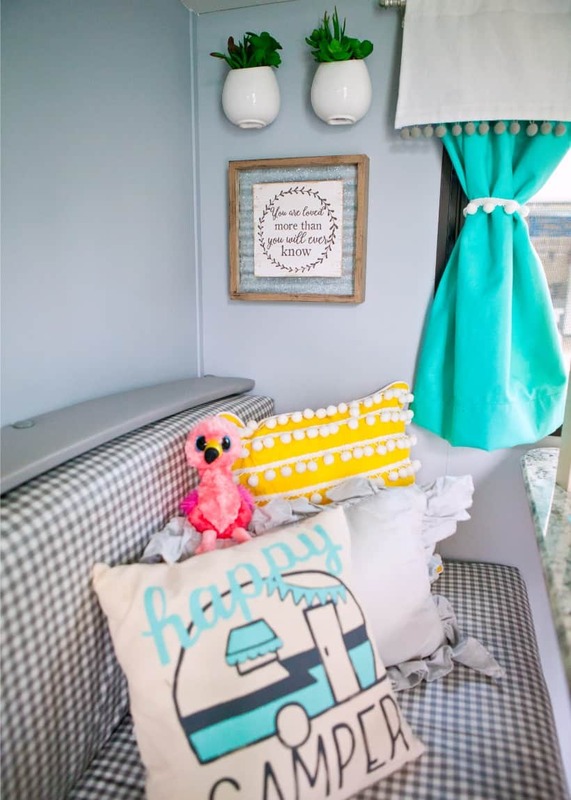 I’ll give you all the details so you can create your own camper makeover with this boho-chic style that includes flamingoes and some of my favorite colors. 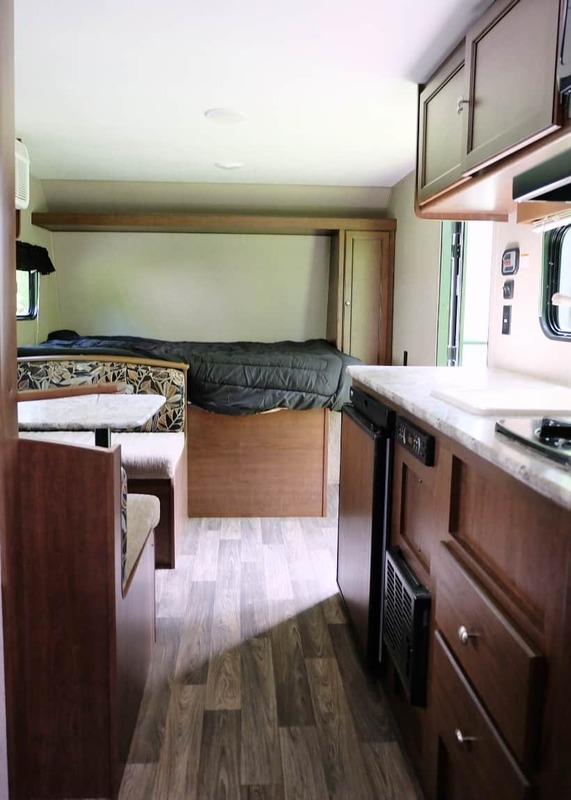 Here is a before photo of the RV remodel. I love seeing the transformation that a little paint and elbow grease can accomplish! 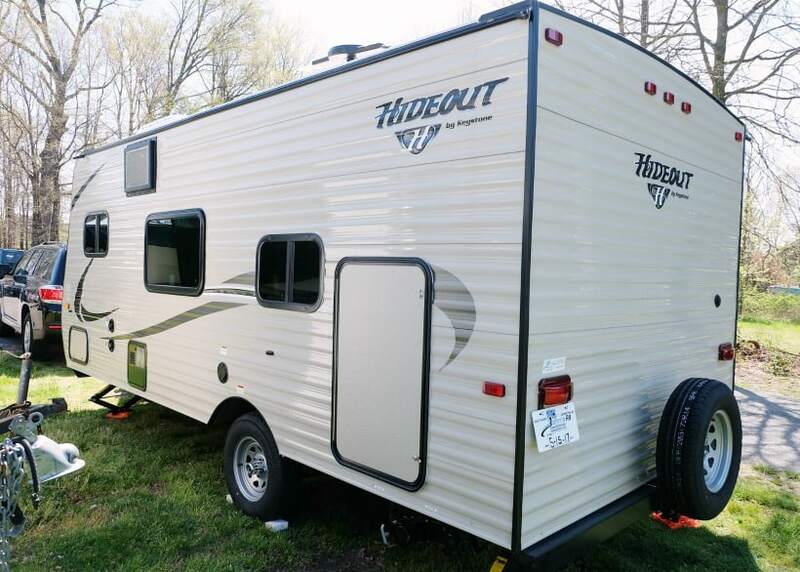 Before the camper makeover this 2017 Keystone Hideout 175LHS Bunkhouse was a bit dark and cave-like. It’s definitely not the worse “before” photo I have seen of a camper before but Brooke wanted a vintage feel. She took this new camper and did an amazing makeover on it to get the vintage charm she wanted, but couldn’t find in older models. 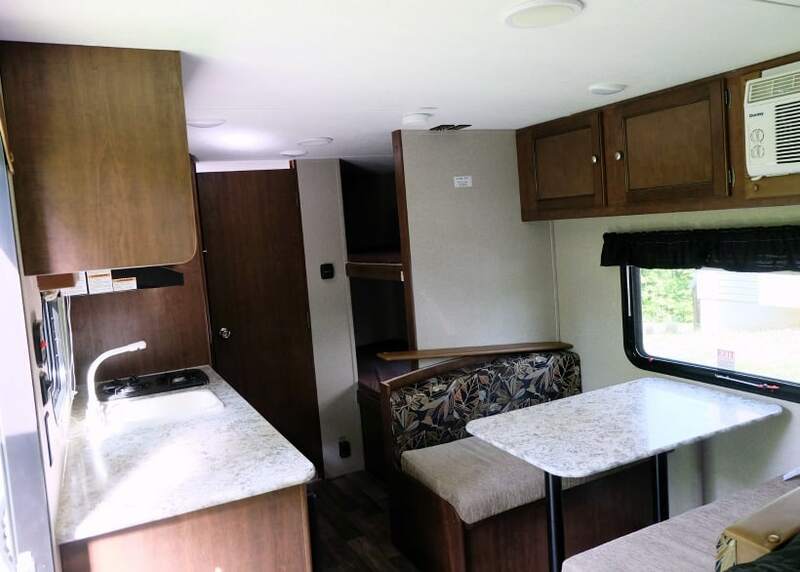 The inside of the camper was transformed by first painting the walls gray and the cabinets and woodwork white. This step alone made her feel fresh and bright and ready for a modern makeover. Brooke named her beautiful camper Lola. For the next month she played around getting Lola decorated and all dolled up to fit a vision that had been floating around in her mind for years. The first accent they added were little canvases that their kiddos painted of Lola to hang next to their bunks (photo below). 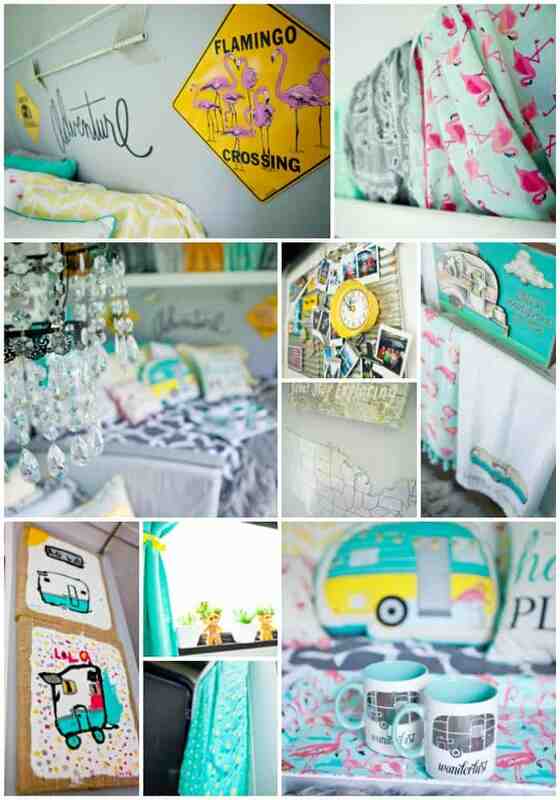 They used those colors, turquoise, sunshine yellow, flamingo pink and soft gray to tie into their color palette. 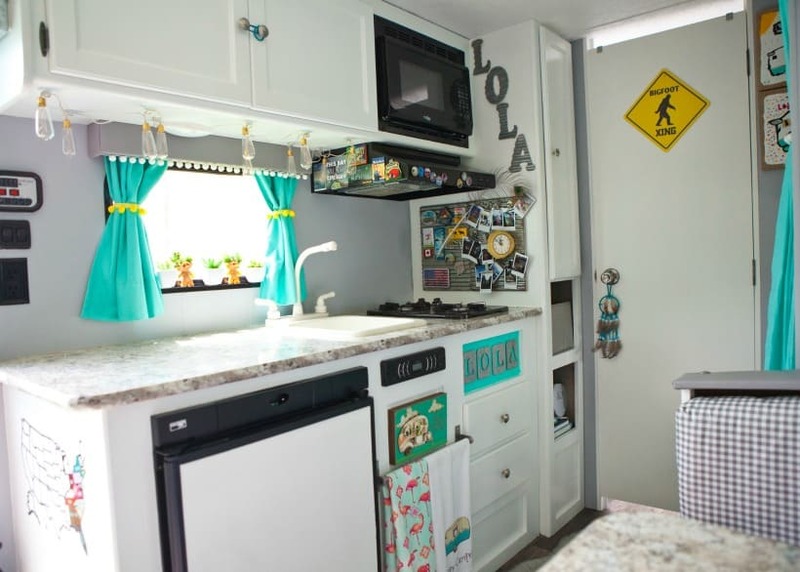 The camper’s kitchen features white cabinets and colorful decor to add splashes of color throughout. 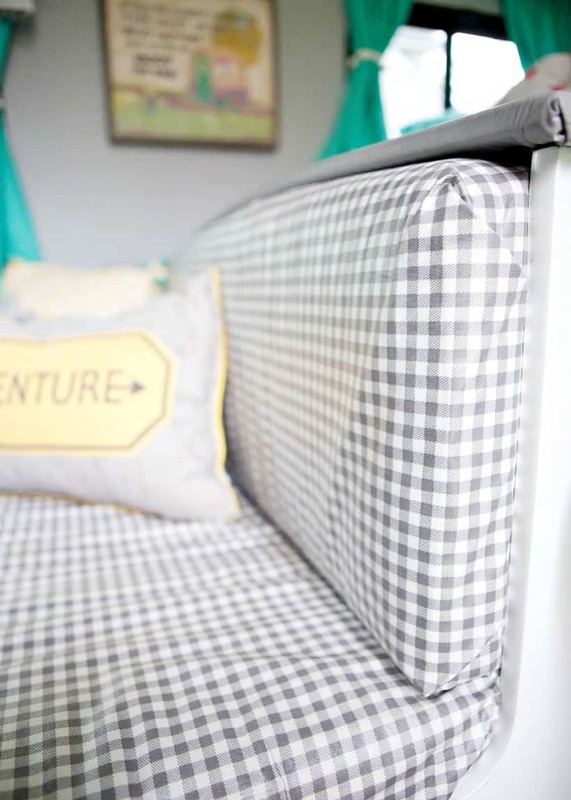 The dinette cushions were recovered in gray and white checkered fabric. Colorful pillows and wall decor was added to the dinette as well. Don’t forget the stuffed flamingo! Succulent planters on the wall complete the decor in the dinette area. 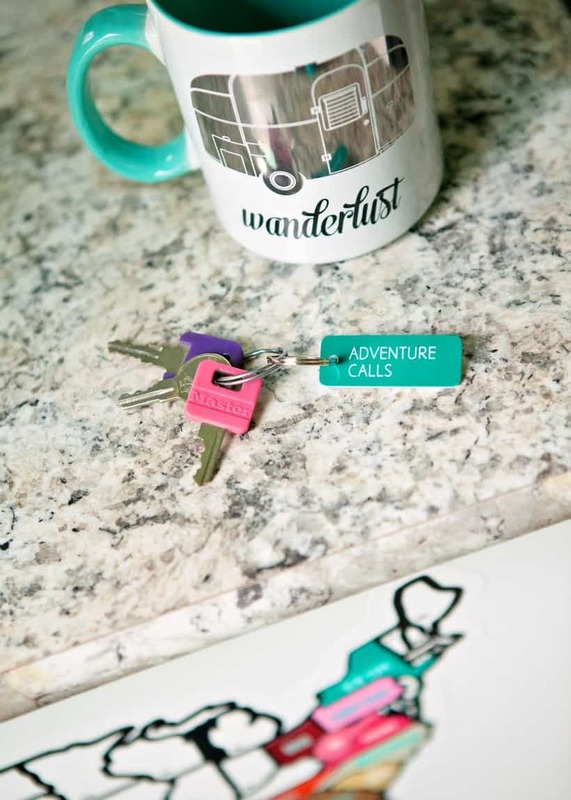 Little touches like these wanderlust coffee cups and hilarious sign on top of a flamingo tray add fun pops of color and charm. 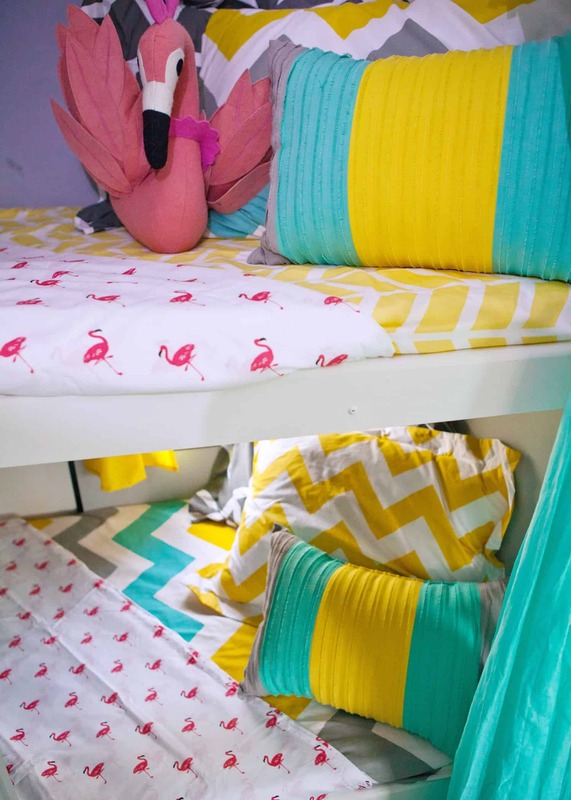 The bunk room features flamingo sheets paired with bold pops of yellow and turquoise. The yellow chevron stripes pair perfectly with the bold colors and patterns. These kid-made signs are what inspired the whole color pattern of the camper. 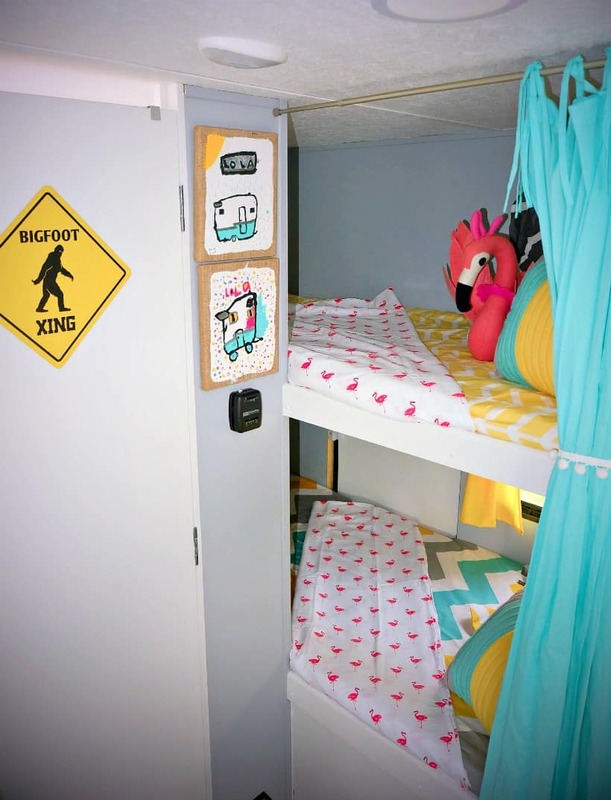 Add a stuffed flamingo and bigfoot crossing sign to complete the look. 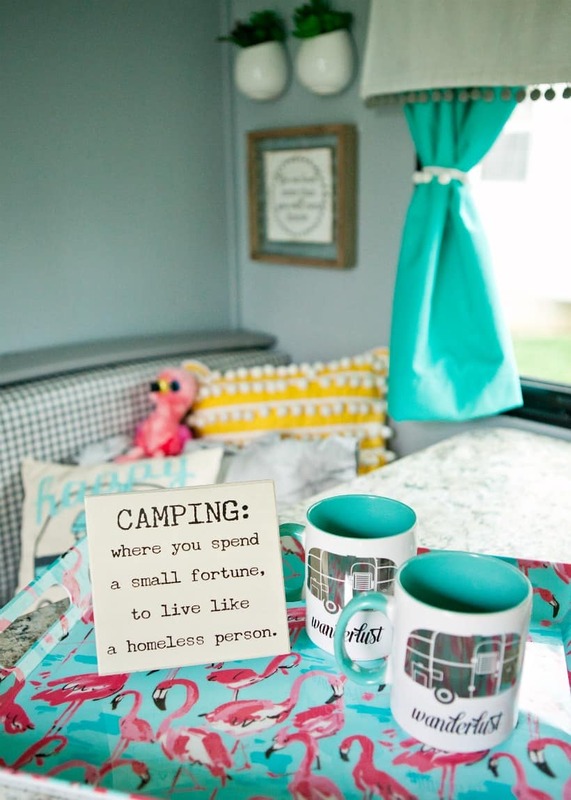 Extra decorative touches throughout the camper, like this flamingo crossing sign, add flair and character to this design. 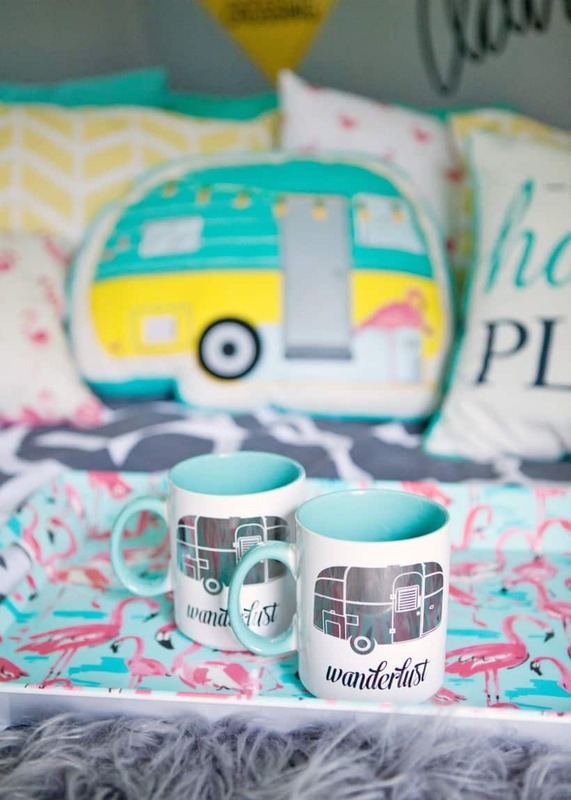 Grab your favorite camper coffee mugs and flamingo tray and pair with massive amounts of pillows. 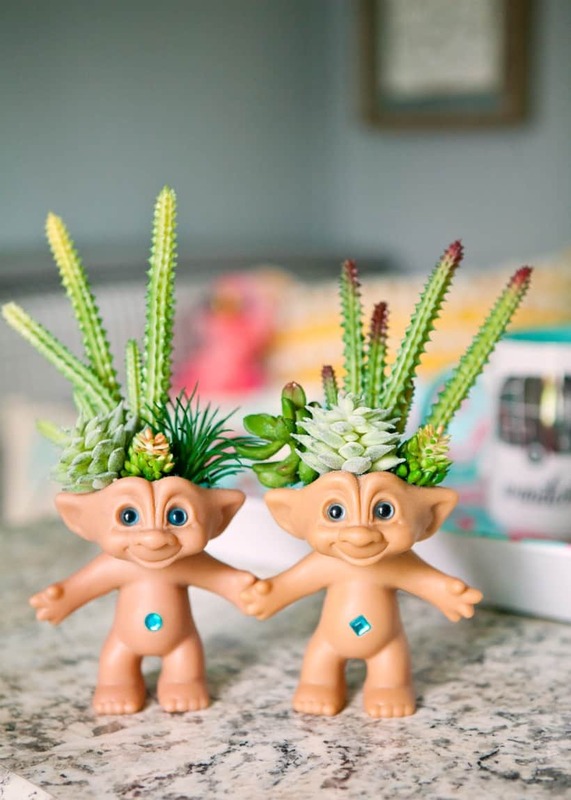 These trolls succulent planters are my favorite. 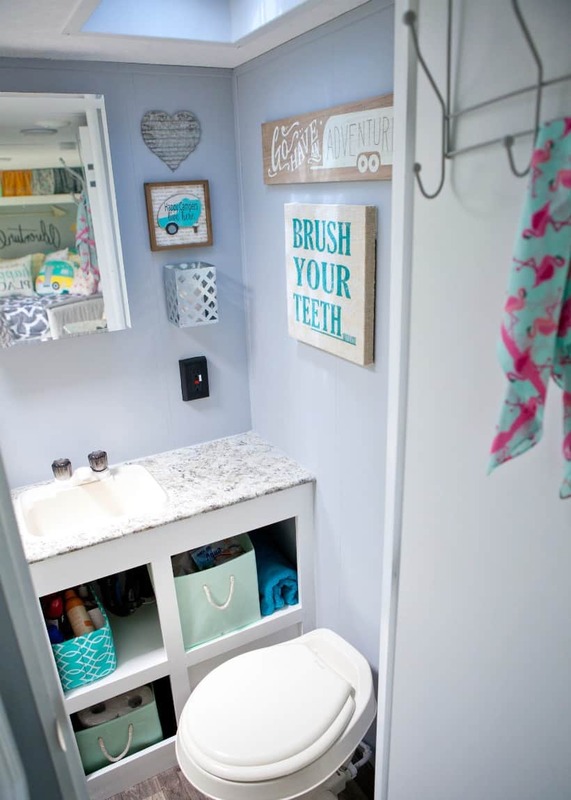 Brightly colored baskets organize the bathroom. Don’t forget to match the keys! A colorful keychain and matching key covers complete the color scheme. They even updated the exterior. Here is the “before” look. And here is their retro made-over look for the exterior! I love the blue stripe they added which adds all the retro charm this camper needed! and you can follow her on IG and FB @brookedanielsphotography. 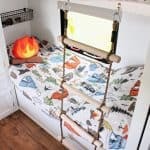 RV Bunk Ladder DIY + RV Bunkhouse Remodel! 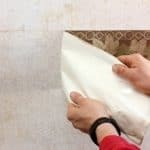 How To Remove Wallpaper Border Quick & Easy Trick! 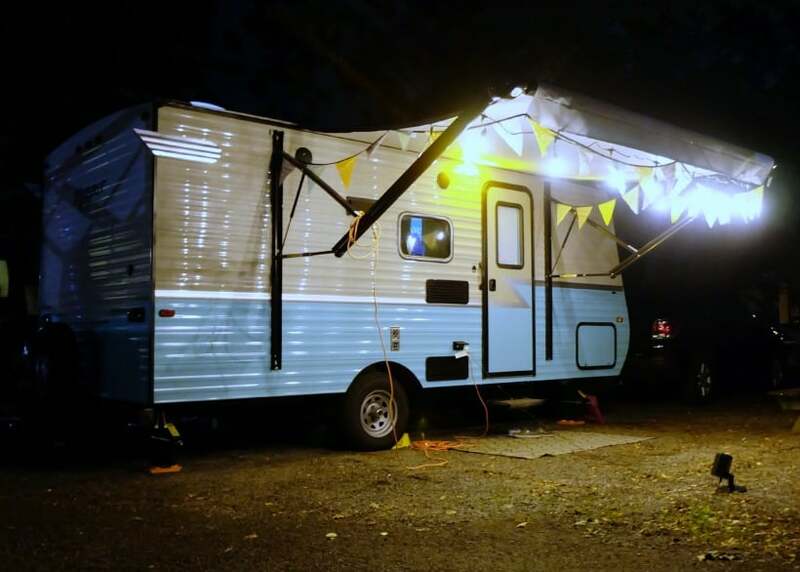 This is the absolutely cutest little camper! Great job and what fun you must have with the family. Kudos!!!!!!! Thank you so much! Camping is our favorite thing to do! I’m in the process of decorating my camper and found some cute ideas. The colors and whimsical decor are so much fun. Enjoy the adventure. I’m not sure where she found the chandelier, but I love it! I have been pouring through your posts and I just wanna say that I am filled with inspiration and I can’t tell you how much I appreciate you detailing everything out with easy links and responding to people’s questions. I’ve been reading through and taking notes for our camper. Oh I am so glad to hear that Julie! I have more coming too so stay tuned! Do you know if she changed out the mattresses for the bunk area? I’m considering this layout for a year long trip with my daughter only I’ll be using the bottom bunk because prefer to sleep in enclosed small spaces. I worry thought that the thin mattress will not allow for a restful sleep. I plan to transform the upper bunk into extra storage. 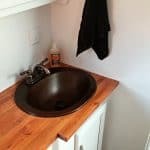 This is a gorgeous remodel and truly an inspiration for me! No, I don’t believe the mattresses look like they’ve been changed out. They look pretty thin. I would suggest adding a foam topper to it and cutting it to size.